Hasi Ban gaye lyrics were penned by Kunaal Verma. 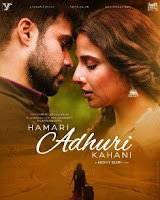 The song Hasi Ban gaye was sung and composed by Ami Mishra for the film Hamari adhuri kahani . The film was directed by Mohit Suri.